One of my best selling stories has been Beautiful Disaster, which was published as part of an Amber Pax collection by Amber Quill Press a few years back. What readers don’t know is, at the time it was published, I had to cut about 15,000 words from the story to bring it under the word count required by the publisher. Now that the rights to the original story have reverted back to me and I’ve re-published Beautiful Disaster through JMS Books LLC, I wanted to make the full story available to readers. However, I didn’t want to just add the cut scenes back into the story, because so many people had already purchased (and loved) the original. Why, release the snipped subplot as a separate e-book, of course! Encore is set immediately after Beautiful Disaster ~ I mean, literally. You can basically read them back to back and Encore feels like another chapter. In it, I’ve reworked the subplot where the boys in the band 2ICE, Corey and Ian, come out to their managers, Dean and Kate. 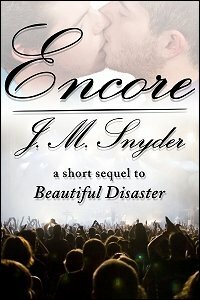 If you loved Beautiful Disaster and wanted a follow-up to see how Corey and Ian break the news of their relationship to others, then pick up a copy of Encore today!